C.A.W. HVAC Company Inc is proud to serve the Mathis community! About Mathis, TX - Happy to be your hometown Heating & Air Conditioning Contractor! Mathis is a small town in San Patricio County, Texas. Home to over 5,000 residents, the area is known for its natural amenities, farming and ranching, and history. Public education services are provided by the Mathis Independent School District and for continuing education there are many colleges and universities in nearby Corpus Christi. 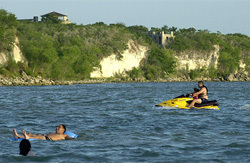 Lake Corpus Christi State Park is located in Mathis and provides an array of activities that can be enjoyed including hiking, camping, picnicking, fishing, boating, swimming, water sports, bird watching and more. The Texas Parks & Wildlife Department is based in Mathis. Children and adults alike can enjoy the wildlife at Waynes World Safari. The climate in Mathis is hot during the summer months and mild during the winter months. This allows for favorable farming and ranching conditions, as well as the enjoyment of outdoor activities, events and festivals year-round.